More than 1,200 people have come to the concert of Russian saxophone virtuoso Igor Butman and his Moscow Jazz Orchestra in Washington DC on Friday. 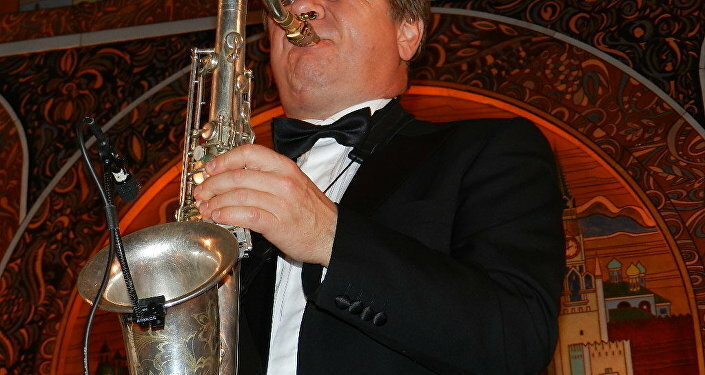 WASHINGTON (Sputnik) — Butman’s concert at the Lincoln Theatre featured composer, trumpeter and nine-time Grammy winner Wynton Marsalis, and was part of the fifth anniversary celebration of the Carmel Institute of Russian Culture and History at the American University. US philanthropist Founder of the Institute and Susan Carmel told Sputnik that once the information about the concert was posted online, they received a tremendous response. “We are waitlisted tonight, and we are 1, 500 people. The theatre sits 1,200,” Carmel said. Russian Ambassador to the United States Sergei Kislyak, former US ambassadors to Russia John Beyrle and James Collins, as well as former congressman James Symington were among those who attended the concert. Carmel stressed that holding such events is very important for US-Russia relations. “To me the whole basis of the institute any my purpose of founding it was to help improve US-Russia relations trough cultural diplomacy, reaching out to younger people, reaching out to younger generations so they can understand the importance of cultural interaction, finding common bonds, not looking at each other through stereotypical vision, and to be able to have cultural dialogue, and a better dialogue for the future,” she explained. Butman told Sputnik that prior to Washington, he and the orchestra had already given two performances in Colorado, an evening concert and an afternoon concert for the children, and they were full house concerts. Butman pointed out, however, that while the American pop culture is well known everywhere in the world, including in Russia, in the United States people don’t know anything about the Russian pop culture or Russian jazz. “We should do something so they know it,” he added. Butman noted that American jazz musicians come to Russia a lot, and they are loved by the Russian audience. He also underlined the importance of coming to the United States with such concerts. “We have to show American people that Russia is not only bears and classical music and military songs. There are contemporary great young jazz musicians and bands that play great music as good as anybody in the world,” the musician said. Butman and his Moscow jazz orchestra will further travel to Houston, Texas to perform at Midtown Arts and Theater Center on Sunday. In November, the musicians will head to China. In the beginning of next year, they plan to return to the United States to participate in APAP (Association of Performing Arts Presenters) convention in New York.